Java TreeMap class is a red-black tree based implementation. It provides an efficient means of storing key-value pairs in sorted order. Java TreeMap contains values based on the key. It implements the NavigableMap interface and extends AbstractMap class. Java TreeMap contains only unique elements. Java TreeMap cannot have a null key but can have multiple null values. Java TreeMap is non synchronized. Java TreeMap maintains ascending order. Let's see the declaration for java.util.TreeMap class. Let's see the Parameters for java.util.TreeMap class. K: It is the type of keys maintained by this map. V: It is the type of mapped values. TreeMap() It is used to construct an empty tree map that will be sorted using the natural order of its key. TreeMap(Comparator<? super K> comparator) It is used to construct an empty tree-based map that will be sorted using the comparator comp. TreeMap(Map<? extends K,? extends V> m) It is used to initialize a treemap with the entries from m, which will be sorted using the natural order of the keys. TreeMap(SortedMap<K,? extends V> m) It is used to initialize a treemap with the entries from the SortedMap sm, which will be sorted in the same order as sm. Map.Entry<K,V> ceilingEntry(K key) It returns the key-value pair having the least key, greater than or equal to the specified key, or null if there is no such key. K ceilingKey(K key) It returns the least key, greater than the specified key or null if there is no such key. void clear() It removes all the key-value pairs from a map. Object clone() It returns a shallow copy of TreeMap instance. Comparator<? super K> comparator() It returns the comparator that arranges the key in order, or null if the map uses the natural ordering. NavigableSet<K> descendingKeySet() It returns a reverse order NavigableSet view of the keys contained in the map. NavigableMap<K,V> descendingMap() It returns the specified key-value pairs in descending order. Map.Entry firstEntry() It returns the key-value pair having the least key. Map.Entry<K,V> floorEntry(K key) It returns the greatest key, less than or equal to the specified key, or null if there is no such key. void forEach(BiConsumer<? super K,? super V> action) It performs the given action for each entry in the map until all entries have been processed or the action throws an exception. SortedMap<K,V> headMap(K toKey) It returns the key-value pairs whose keys are strictly less than toKey. NavigableMap<K,V> headMap(K toKey, boolean inclusive) It returns the key-value pairs whose keys are less than (or equal to if inclusive is true) toKey. Map.Entry<K,V> higherEntry(K key) It returns the least key strictly greater than the given key, or null if there is no such key. K higherKey(K key) It is used to return true if this map contains a mapping for the specified key. Set keySet() It returns the collection of keys exist in the map. Map.Entry<K,V> lastEntry() It returns the key-value pair having the greatest key, or null if there is no such key. Map.Entry<K,V> lowerEntry(K key) It returns a key-value mapping associated with the greatest key strictly less than the given key, or null if there is no such key. K lowerKey(K key) It returns the greatest key strictly less than the given key, or null if there is no such key. NavigableSet<K> navigableKeySet() It returns a NavigableSet view of the keys contained in this map. Map.Entry<K,V> pollFirstEntry() It removes and returns a key-value mapping associated with the least key in this map, or null if the map is empty. Map.Entry<K,V> pollLastEntry() It removes and returns a key-value mapping associated with the greatest key in this map, or null if the map is empty. V put(K key, V value) It inserts the specified value with the specified key in the map. void putAll(Map<? extends K,? extends V> map) It is used to copy all the key-value pair from one map to another map. V replace(K key, V value) It replaces the specified value for a specified key. boolean replace(K key, V oldValue, V newValue) It replaces the old value with the new value for a specified key. void replaceAll(BiFunction<? super K,? super V,? extends V> function) It replaces each entry's value with the result of invoking the given function on that entry until all entries have been processed or the function throws an exception. NavigableMap<K,V> subMap(K fromKey, boolean fromInclusive, K toKey, boolean toInclusive) It returns key-value pairs whose keys range from fromKey to toKey. SortedMap<K,V> subMap(K fromKey, K toKey) It returns key-value pairs whose keys range from fromKey, inclusive, to toKey, exclusive. 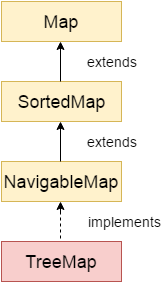 SortedMap<K,V> tailMap(K fromKey) It returns key-value pairs whose keys are greater than or equal to fromKey. NavigableMap<K,V> tailMap(K fromKey, boolean inclusive) It returns key-value pairs whose keys are greater than (or equal to, if inclusive is true) fromKey. boolean containsKey(Object key) It returns true if the map contains a mapping for the specified key. boolean containsValue(Object value) It returns true if the map maps one or more keys to the specified value. K firstKey() It is used to return the first (lowest) key currently in this sorted map. V get(Object key) It is used to return the value to which the map maps the specified key. K lastKey() It is used to return the last (highest) key currently in the sorted map. V remove(Object key) It removes the key-value pair of the specified key from the map. Set<Map.Entry<K,V>> entrySet() It returns a set view of the mappings contained in the map. int size() It returns the number of key-value pairs exists in the hashtable. Collection values() It returns a collection view of the values contained in the map. What is difference between HashMap and TreeMap? 1) HashMap can contain one null key. TreeMap cannot contain any null key. 2) HashMap maintains no order. TreeMap maintains ascending order.